When the second round of 'Watch the World' tour appearances were announced, it became apparent that a trip or two to California was in order. You see, there hasn't been a confirmation on a new appearance in my hood of Phoenix, Arizona. Anyway, traveling for somebody you respect along with meeting up with fellow fans who are now your friends after previous events is just too hard to pass up. I had originally thought I couldn't make the trip to San Diego due to higher priced flights, and my older car, but due to the previous week of good vibes in my life (that I attribute to Markus Schulz) I decided to take the road trip. After all, there are beaches in San Diego, and it had been a couple years since I saw a beach in person. It is funny how life and plans work out. 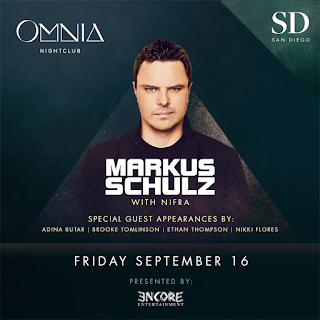 After a short visit to Ocean Beach, I drove Downtown to kill time before meeting up with friends at Omnia Nightclub San Diego. The Gaslamp district was vibrant as ever, and I ended up finding the venue. After paying too much for parking across the street, I decided to venture to the Courtyard by Marriott directly across the street from the venue to seek out availability. Upon searching for discounts, I opted to use my AAA and to book. After presenting my ID to the front desk and explaining that I had drove 5 hours just for this event, I was awarded with a bigger discount. After a quick snack at the rooftop lounge, I finally was able to meet up with Desaree & Patrick. Then Angel and Juan joined me for another round (following San Francisco). I just love that music and events bring people together in a unique way. Another opening set by Nifra did not disappoint, and got the crowd dancing. Many different groups of people were out for a good time, and it showed. Whether you are a fan of trance or Markus Schulz, the entertainment he brings to each one of his sets is unlike many others. The entrance by Mr. Schulz alone will grab your attention right away. Another great experience with my Trance Family, #SchulzArmy, Markus Schulz and guests was had. The performances by Brooke Tomlinson, Adina Butar, De'lacey, and Nikki Flores did not disappoint. Huge thank you to Markus for recognizing me once again along with your concern upon my reaction. It was all just chaotic, and I was floored. Please enjoy more memories from the night!